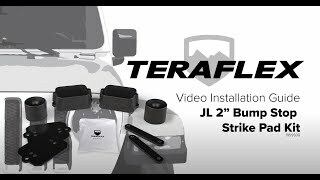 The TeraFlex JL/JLU: 2” Front & Rear Bump Stop Strike Pad Extension Kit extends the reach of the factory bump stops on lifted JL/JLU Wrangler models to soak up energy during hard compression and suspension movement. Combine with our JL/JLU: 0.5” Front & Rear Bump Stop Strike Pad Shim Kit(s) (# 1959300) to fine tune your strike pad height. • Sport/Sahara Fenders require 3” front and 2.5” rear bump stop extensions and shims in order to fit 35” tires. Requires 0.5” Front & Rear Bump Stop Strike Pad Shim Kit(s) (# 1959300) – NOT INCLUDED. • Sport/Sahara Fenders require 3.5” front and 4” rear bump extension and shims in order to fit 37” tires. Requires two (2) 0.5” Front & Rear Bump Stop Strike Pad Shim Kits (# 1959300) – NOT INCLUDED. • Rubicon Fenders require 2.5” front and 3” rear bump stop extensions and shims in order to fit 37” tires. Requires 0.5” Front & Rear Bump Stop Strike Pad Shim Kit(s) (# 1959300) – NOT INCLUDED. • Rubicon Fenders require 2.5” front and 3” rear bump stop extensions and shims in order to fit 37” tires. Requires two (2) 0.5” Front & Rear Bump Stop Strike Pad Shim Kits (# 1959300) – NOT INCLUDED. • Aftermarket High Fenders required to fit 39”+ tires. Bump extension and shim requirements will vary based on setup including wheel/tire combination, shock collapsed length, and fenders. Installer must check for clearances. We recommend two (2) 0.5” Front & Rear Bump Stop Strike Pad Shim Kits (# 1959300) – NOT INCLUDED.